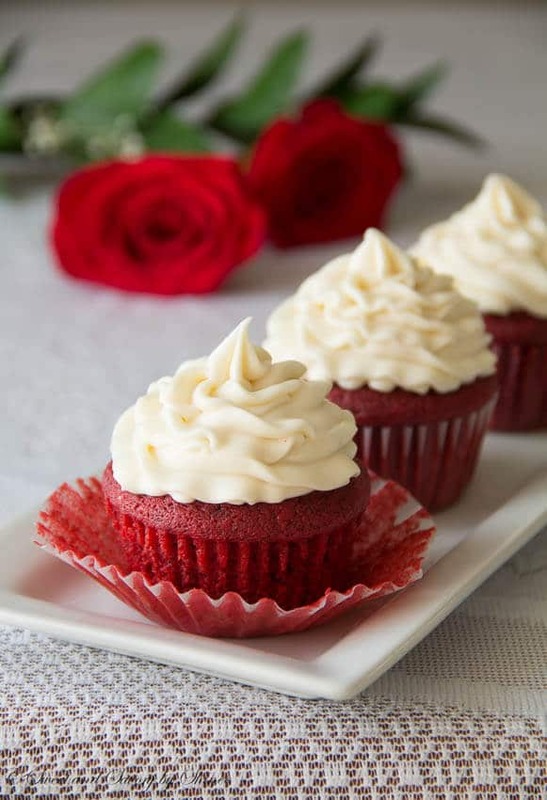 Classic red velvet cupcakes with velvety texture and buttery soft crumbs and topped with tangy cream cheese frosting. The month of December is upon us. Holiday season is here! It’s such a joyful and exciting time of year. To me, December is a month of red, green and gold. To kick-start this holiday season, I prepared one of my favorite cupcakes. Red Velvet Cupcakes! Anyone who knows me will tell you that I love pretty much anything red. However, the color of this cake is not the only reason I love it so much. If it’s done right, this cake has smooth velvet-y texture with soft crumbs. Let’s talk about the texture and flavor of this cake for a little bit. This is NOT just another cake with red food coloring. Red velvet cake is a deliciously moist and airy cake with buttery soft crumbs. It has just a hint of cocoa without overpowering chocolate flavor. What really completes this cake is, of course, sweet and tangy cream cheese frosting. 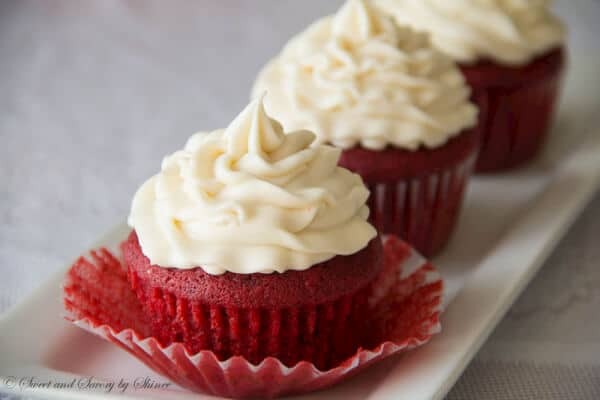 If you have never had red velvet cake before, or never understood what’s the big deal about it, I urge you to go to your kitchen and make these cupcakes right away. Once you have one, two, or maybe three cupcakes in one sitting, like I did, you will understand what I’m talking about. The recipe is pretty simple. Here is the visual for you. Keep scrolling for the full recipe. Preheat the oven to 350 degrees F (175 degrees C). Line muffin pans with paper cupcake liners. Whisk together flour, sugar, cocoa and salt. Set aside. In a large mixing bowl, beat the egg, vegetable oil, buttermilk, red food coloring, and vanilla extract until well combined. Add the flour mixture and mix until smooth, about a minute. In a small dish, mix together baking soda and vinegar. While the soda/vinegar mixture is bubbling, add it to the batter and mix well. Using a large cookie scoop, fill the cups 2/3 of the way. Bake for about 18-20 minutes, or until inserted toothpick comes out clean. Cool the cupcakes for 5 minutes in the pan. Then transfer onto a wire rack to cool completely. To make the frosting, beat butter and cream cheese on medium high speed until fluffy, about a minute. Add powdered sugar, heavy cream and vanilla extract. Beat on low speed for a minute. Then increase the speed to medium high and continue to beat until smooth and fluffy, about 3 minutes. 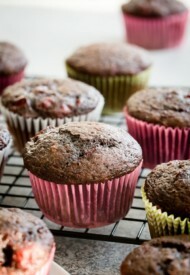 Transfer the frosting into a pastry bag and frost the cupcakes when they’re completely cooled. Oh My Goodness. I have made alot of red velvet desserts using many different recipes. I received so many compliments when I used this recipe. I this only thing that is different from other recipes is mixing the baking soda & vinegar separately. It made all the difference in the world when it comes to taste & texture. Sooo good! For some stupid reason I did not save this recipe when I made it. I have been searching for it ever since lol 2 weeks later, I found it, saved it, printed it, laminated it & put it in a safe place lol. This will be the only RV recipe I use from now on. I did use my own CC buttercream recipe which is the best!! Hi, Madlena. Thank you for your honest feedback. Definitely didn’t like your frosting recipe – it was incredibly runny, even after refrigeratorating. Yes, I used Philadelphia cream cheese in the block – always do. Still way too runny and it greatly decreased the aesthetics of the cupcake. Back to my original frosting recipe I go. Hey, Paige. I’m sorry your frosting didn’t turn out. You didn’t decrease the sugar amount, right? This’s a no fail cream cheese frosting recipe that I always use. I even used it for a friend’s wedding cupcakes, and they were beautiful, just like the cupcakes on the picture here. I left the whipping cream out and had the perfect frosting for piping. You can always use a tiny bit of milk if it’s too thick. I made it and everyone loved it. I want to do more but I’m afraid to double the recipe. Have you ever doubled it, and if so did you get the same results? And I saw your photo of your cupcakes. They’re gorgeous. Thanks for sharing it! Thank you! I will most definitely try more of your recipes. I love the simplicity of this one. Hello I have made this recipe several times and I must say it gets better every time! My family loves them! I have a question. Can this recipe be doubled and made as a cake instead of cupcakes and still have the same moist flavor and texture? Hi, Rhonda! So happy you love these cupcakes!! Yes, you can do that. I actually shared the cake version here too. https://www.sweetandsavorybyshinee.com/super-tall-red-velvet-layer-cake/. And thank you for sending the photo of your beautiful cupcakes! I was so excited to try this recipe because Red Velvet is my absolute favorite! I was disappointed with these 😔 I followed the recipe 100% and I have to say my family and I all agree this tasted nothing like red velvet ! It was more like a vanilla dyed red and the frosting was delicious but did not hold. Hi, Josephine! I’m sorry to hear you were disappointed with the cupcakes. I’m surprised that they taste more like vanilla, despite the addition of cocoa powder. Anyway, I appreciate your feedback and thanks for trying my recipe! Frosting tastes awesome! The cupcakes themselves came out looking great but were a bit heavy, not as light as I’d want a cupcake to be. The egg and buttermilk I used were not at room temperature, could this have been the cause? Otherwise the recipe was awesome, great instructions and super easy to follow for a beginner like me! Hi, Anastasia! So glad you tried my recipe and thank you for your honest feedback. Having egg and buttermilk at room temperature aids the batter to blend better, thus it does affect the texture of the cake. Next time try to bring those ingredients to room temperature before baking and see if there’s difference. Also, don’t mix the batter for too long after you add flour, otherwise too much gluten will form and will make the cake denser. I’ve been searching for a red velvet rfor cite for ages… and yours seems perfect! Just one question though… I live in Portugal and do not get any other vinegar other than white wine vinegar! Can white distilled vinegar be substituted with white wine vinegar? If not can you give me another alternative, I did notice your comment earlier about baking soda and white distilled vinegar replacing baking powder! Awaiting your reply as I want too make these soon….they are so yummy! Hi, Nina! What kind of food coloring are you using? I use this McCormick liquid red food coloring and I get that beautiful bright color every time. Hi! I made the cupcakes and they turned out amazing! I want to bake a birthday cake in round 9inch pan… Would this recipe work? What are your thoughts on how to bake in oven and temp? Thanks!! Hi, Kathy! I’m so glad you tried the cupcakes. I’ve never tried making the cake version out of this recipe though. But I don’t see why you couldn’t. I’d bake the cake at 350°F for 20 min and check for doneness by inserting a toothpick in the center. Hope this helps. Hi Shinee! 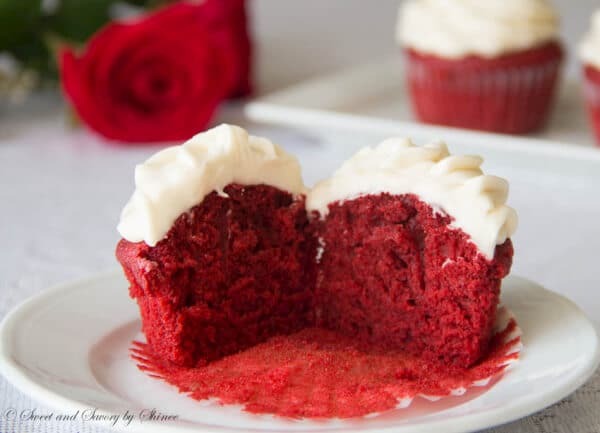 Sounds like an AMAZING recipe you have here- I am using this recipe to make BLUE velvet cupcakes for a baby shower on the weekend- can’t wait to try it!! Just a question- I have noticed there is no baking powder in this recipe and the flour is not self-raising; do the cupcakes still rise and if so, what is the raising agent in this recipe? Hi, Chelsea! The raising agent in this recipe is baking soda with vinegar that you add at step #4. Hope this helps. And happy baking! Have not eaten one of these cupcakes yet, but the frosting is So Runny. It’s practically running off the cupcakes even as I type this. It tastes fine! But it has the wrong texture. Maybe it needed more butter? Hi, Laura! What kind of cream cheese did you use? Hope it wasn’t the one in a round plastic tub, which is cream cheese spread. I also had a runny frosting result when I used generic Walmart cream cheese. So I only use Philadelphia cream cheese bricks. i made these and while the batter was delicious they went totally flat in the oven! Actually they completely fell into the middle. Not sure what happened. Bronni, sorry your cupcakes went flat on you. There could be multiple reasons for that to happen. 1. The batter was mixed for too long, creating too much air bubbles in the batter. 2. The oven temperature was off. 3. If the oven door was opened during baking, it will also cause the collapse. 4. If you’re in high altitude, the recipe should be adjusted accordingly. Hope this helps. Hi, Allz! Sorry for late response. I wouldn’t suggest using milk in this recipe. Buttermilk is essential. If you absolutely can’t find buttermilk, you can make a homemade version by adding about 1 tablespoon lemon juice in 3/4 cup milk. Let it sit for 5 minutes before using. Hope this helps. I made these today and although the cupcakes were SO fluffy and light, the frosting was veeery runny.. But it was probably something I did wrong because it tastes amazing (the measurements where exact).. I just saw a previous comment of yours! I used philadelphia cream cheese ase well..
Hi, Katerina! I’m glad your liked the cupcakes. I wonder why the frosting was runny though, since you did use Philadelphia cream cheese, which is what I use too. Did you use the block cream cheese, right? Not the one in the round container? And was it regular cream cheese, or less fat version? Hope we can get to the bottom of this issue. Thank you for replying Shinee! 🙂 I took them to a party yesterday and they were a hit! You can make the frosting up to 1 day ahead. (I’ve done that.) Just cover with plastic wrap and refrigerate. Also, I’d suggest beating it for a minute or two to fluff it up before frosting the cupcakes. 12 regular size cupcakes, Anthony. What kind of cream cheese did you use? The reason I’m asking is because I once used generic brand cream cheese, and it was so runny. So, I only use Philadelphia cream cheese, and never had that problem again. Did you use the same cream cheese as the first time you tried? Hi, Lara! I’m so happy to hear that you made my favorite red velvet cupcakes all by yourself. Glad that your family loved them too. I can imagine how beautiful your cupcake bouquet will be! Good luck on your bake-off competition! Hello shinee! 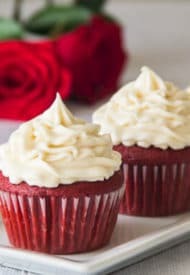 Your red velvet cupcakes look perfect! I tried to make it but the color didn’t come out as bright as yours although i also used liquid food coloring. What brand do you use? Sandra, I use this McCormick red food coloring. It works perfect for me. Is this unsweetened cocoa ? Yes, natural unsweetened cocoa powder. I just updated the recipe. Thank you for asking, Andrian. I’m sorry that you didn’t like the cupcakes, Lee. I wonder what went wrong? Would you elaborate on nasty? Was it bland, was it dense, or something else? Did you substitute anything, or changed quantity? I’m just trying to see if it was something that was preventable. 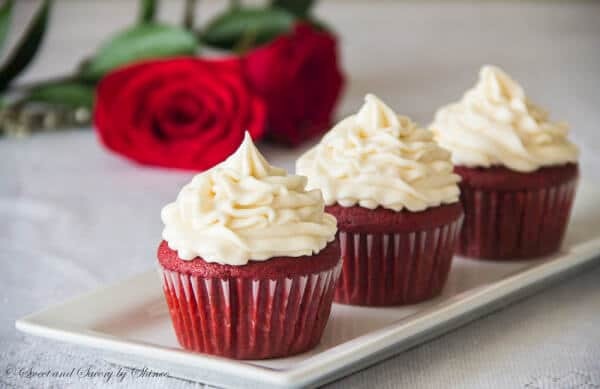 It’s my go-to red velvet cupcake recipe, and I’ve made it so many times, including for a wedding with 150+ guests. Everyone loves it. Hey Shinee!! I just discovered your website and i love it!!!! Your recipies are amazing and the website looks very nice and professional. Im loving it!!! This red velvet cupcake looks amazing and im actually going to use it for a class project. however, i will be changing up the icing into a white chocolate cream cheese frosting. Thanks for your help. Ill be sure to give you credit when i present the project in class!!! Red velvet is still my all time favorite. Love this! The same here. My favorite! hi, what kind of flour do you used?what’s the best flour do you recommend? Kaybee, I use all-purpose flour here. These look lovely and I’d like to make them for my husband’s birthday. Did you use the liquid or powdered red food colouring? I have the powdered one. Hi, Suparna! I used liquid food coloring. I’m sure powdered one will work fine, but I can’t advise how much to use, because I never used them. Thank you for stopping by! Red Velvet is definitely one of my favorite cupcake. Love it. I’m gonna try to bake it. I know it’s gonna be fun. These pics were beautifully taken and styled I just love it. 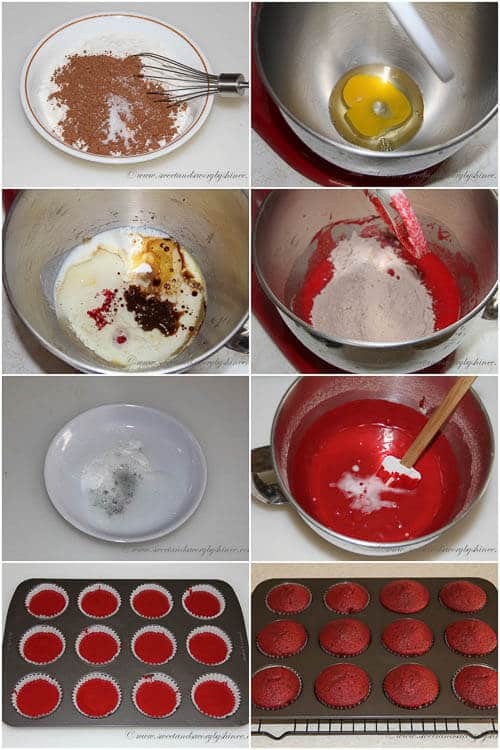 I haven’t made red velvet cupcakes in a long time maybe too long but these pictures have inspired me to do just that. After all it’s Christmas time! Yum! And again beautifully styled! This is why despite a weekend of cranberry relish, chocolate chip cookies, everything bagels, a yummy new salmon recipe and brownies with homemade vanilla bean ice cream my blog is neglected. Audrey, you have a blog? What is it? And thank you for sharing this awesome ice cream recipe! Now I really want to try it. 🙂 I have a growing list of ice cream recipes that I want try and I really need to buy an ice cream machine asap! A mostly (at least for now) inactive blog that I’m fairly shy about. I mainly used it for meal planning/ recording things I’d made and now that I found the BigOven program just keep track of weekly meal plans and recipes on there. After much reviewing (I tend to review kitchen purchases extensively) got the cuisinart ice cream maker . David Lebovitz’s book the perfect scoop is fabulous as well. The Guinness ice cream alone is worth the purchase. I love the meal plan idea… I always try to do that, but never got around it. 🙂 Oh, I too do extensive review before any big purchases, and it was very helpful to read your review on ice cream maker. Thanks for sharing your blog. Very informative! Yamarch tsaraylag cupcake ve, manai huu nadaas red velvet cake hiigeech gej asuugaad baisan enuugeer hiij uznee. Cake hiihed elbeg hurne bizdee. Bayarlalaa. Bayarlalaa, Khaliunaa egchee. Ene 12 cupcakenii zuurmag shuu. 2 6-7inch pan, esvel 1 9-inch pan boloh bh gej bodoj bn.